Chinese medicine is a complete medical system that has diagnosed, treated, and prevented illness for over two thousand years. While it can remedy ailments and alter states of mind, Chinese medicine can also enhance recuperative power, immunity, and the capacity for work and creativity. In the Chinese view, all of the creation contains within it Yin and Yang. These terms refer to the complementary but opposing qualities that make up everything in the natural world. Harmony of Yin and Yang means health while disharmony leads to disease. The strategy of Chinese medicine is to restore balance between Yin and Yang. Since our bodies are in dynamic balance internally as well as with nature, we are constantly making adjustments to maintain equilibrium. Perfect health is not some static state; instead, our bodies stay well by making changes in response to various influences. When we are unable to adapt, whether due to a change of weather or the invasion of a virus, then we fall Ill. Doctors of Chinese medicine use acupuncture, herbs and food to recover and sustain health. Just as Nature contains air, water and land, the human body is comprised of Qi, moisture and blood. Qi is the animating force that gives us our capacity to move, think and feel. Moisture is the fluid which protects, nurtures and lubricates tissue. Blood is the material out of which our bodies create bones, nerves, skin, muscle and organs. Qi, moisture and blood circulate within a web of pathways called channels that link together all the parts of the organism. Health exists when adequate Qi, moisture and blood flow smoothly. Symptoms as varied as joint pain, headache, anxiety, fatigue, menstrual cramps, high blood pressure, asthma, indigestion and the common cold can occur when their circulation is disrupted. In Chinese medicine all illness is understood as a consequence of either a depletion or congestion of Qi, moisture and blood. Depletion leads to weakness, lethargy, frequent illness, poor digestion and inadequate blood flow. Congestion results in aches, tension, tenderness, pain, distension, irritability and swelling. Practitioners of Chinese medicine assess a person’s health by feeling the pulsations at each wrist and observing the colour and form of the face, tongue and body. This information is interpreted in the context of the patient’s present complaints, work, living habits, physical environment, family health history and emotional life. The goal of treatment is to adjust and harmonize Yin and Yang, cold and heat, inner and outer, body and mind. This is achieved by regulating Qi, moisture and blood on the organ networks; weak organs are tonified, congested channels are opened, excess is dispersed, tightness is loosened, agitation is calmed, and heat is cooled. 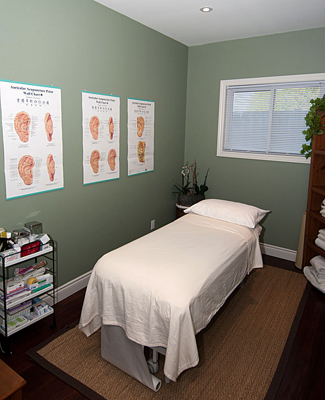 Treatment may incorporate acupuncture, herbal remedies, diet, exercise or massage. Duration of treatment depends on the nature of the complaint, its severity, and how tong it has been present. Acupuncture may be scheduled as often as three times a week or as little as twice per month. Some patients need only a few sessions while others need sustained care to reverse entrenched patterns. Acupuncture is based on the assumption that Qi courses through the channels of the body. Every organ network has a corresponding set of channels. The acupuncture points are located in small depressions in the skin where the channels come closest to the surface. With acupuncture these gates are opened or closed to adjust circulation of Qi in the channels. Thin sterile steel acupuncture needles are inserted into acupuncture points to mobilize Qi, moisture and blood, invigorating the function of muscles, nerves, vessels, glands and organs. Insertion of the needles goes unnoticed by some, and to others feels like a small pinch followed by a sensation of tingling, numbness, ache, warmth or heaviness. Some people feel Qi moving at a distance from the point of insertion. Needles remain in place for 15-20 minutes. Some notice a relief of the symptoms or feel more energetic in the days that follow treatment. Most people are pleased to find that sessions are not uncomfortable and even look forward to them. While it would be most accurate to say that acupuncture treats disorders of Qi, blood and the organ networks, this does not correspond to the Western vocabulary of named diseases and conditions. Acupuncture may be helpful for withdrawal from addictions, stress reduction, post surgical recovery, chronic fatigue, and decreased immunity. An extensive list of conditions for which acupuncture is considered appropriate are listed by the World Health Organization of the United Nations. Sometimes Western medicine has little to offer nagging chronic complaints. Chinese medicine can be very beneficial in these conditions. Western and Chinese medicine are often complementary. To discover if Chinese medicine may be helpful for you, consult your naturopathic doctor.